This week I assembled all the parts onto a perfboard after making a layout with ExpressPCB. I use the layout as a guide when assembling circuits on a perfboard. Once the circuit is proven to work I can make a PCB from the layout. In this case it’s only serving as a guide. After assembling the board and connecting all the external wiring and LEDs I tested the board out. I immediately found an error on pin 8 of the first 555 timer. I failed to connect it to the positive voltage rail! OOPS! After connecting pin 8 the circuit began to function but with a minor flaw. The LEDs connected to the drain of the MOSFETs are staying dimly lit between pulsing cycles. They should be out completely! This will require some troubleshooting on my part. The circuit worked perfectly fine on the breadboard. I’ll be double checking my schematic and the circuit and looking for a possible error. It could also be an issue with the capacitance of a breadboard. I’ve run into this type of thing before. 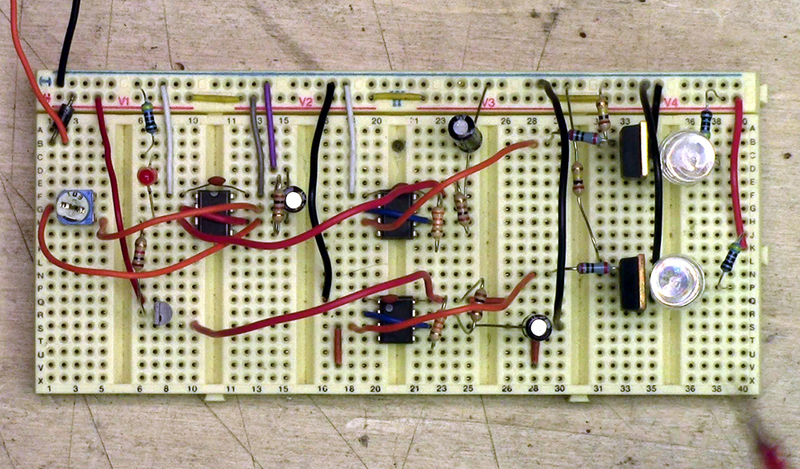 Some breadboards act as a capacitor and can influence the behavior of a circuit. It may be a problem with the way I’ve connected the MOSFET. Here’s is a great beginner’s guide to the MOSFET that helped me understand how they work. If you have any thoughts on this problem and it’s possible cause please join in on the discussion on YouTube or here on the blog. Below you’ll find a schematic of the circuit, a picture of the circuit on the breadboard and of course this week’s video. The schematic. You’ll notice that I have a PNP connected to pin 3 of the first 555. It’s actually connected wrong but it somehow works to turn on the third 555! I’m scratchin my head on this one. I’ve revised this several times and this the current circuit. I now have a BC547 NPN transistor serving as a inverting buffer. This works great to turn on the 555 but I still have a problem with the MOSFET connected to that 555. When it’s connected the flashing stops. Thanks for the feedback. I should probably change all of those resistors between pin 7 & 8 to a 1 watt value. It has to be a value of 100 ohm for the proper timing function. Hmm, I’m not sure if the 555 is happy with the 120mA dumped into it. If you want to maintain the 50% Duty-Cycle you could try Stefan Noack’s suggesstion in the YouTube comments. But since you want the frequency to be variable you would need a Stereo-Pot. Also it would be a good idea to have a 1k resistor in series for both pots, otherwise you’d easily shorten your 12V right to ground on Pin 7. 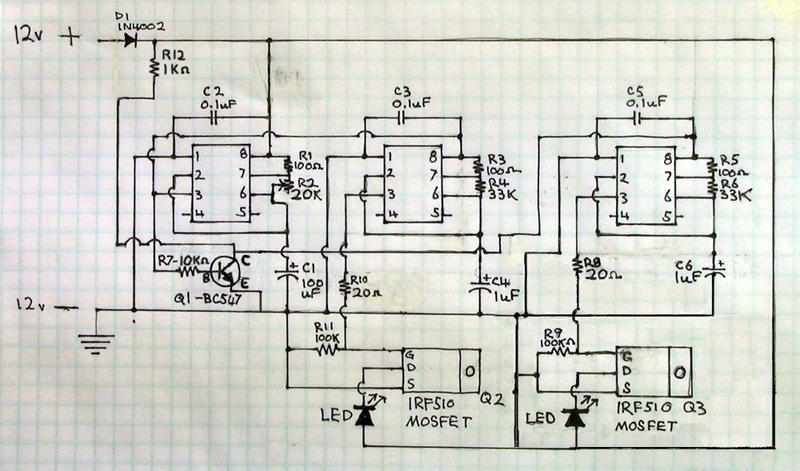 Why not just paste your paper schematic right to the perf board? Component placement and wire routing would then be super easy, and you have a handy reference right in front of you for possible troubleshooting or repair. Errors would be spotted right away. You could even include part numbers and values too. It would be like an enhanced silk screen! I might have to try that next time. Good idea! The output of the BJT Q1 might be getting loaded. Try adding a voltage follower (buffer) . Connect the collector of Q1 to the base of another BJT (Q2) and connect the emitter of the second BJT (Q2) to your +12 V and connect a 10K ohm resistor to the emitter and to your -12 V. This will help out with the loading. R1 and R2 should be in the range 1k to 1M. Forget R11 and R9. Thats all I see at the moment. Good luck! Again me. Just another Thing. You control two timers with the voltage at their pin 8. Normally you control the timers by their reset pin 4. If pin 4 is low, output 3 is low. If pin 4 is high, there are pulses at pin 3. Your solution can work, but we have the reset for this case. Thanks. I should try using that. I know, it’s a messy work to change the circuit 😉 Did just start redesign your circuit to have a clearer view. This 0,1uF capacitors should be between pin 5 and ground. Add an 1k resistor to every potentiometer, so there is at least 1k resist between pin 7 and 6. With online 555-calculators you will find the values for the right frequency. In your schematic is an needless connection. This one, just right of the Q2 would be a short between 12V and ground. I think it’s only in the schematic.